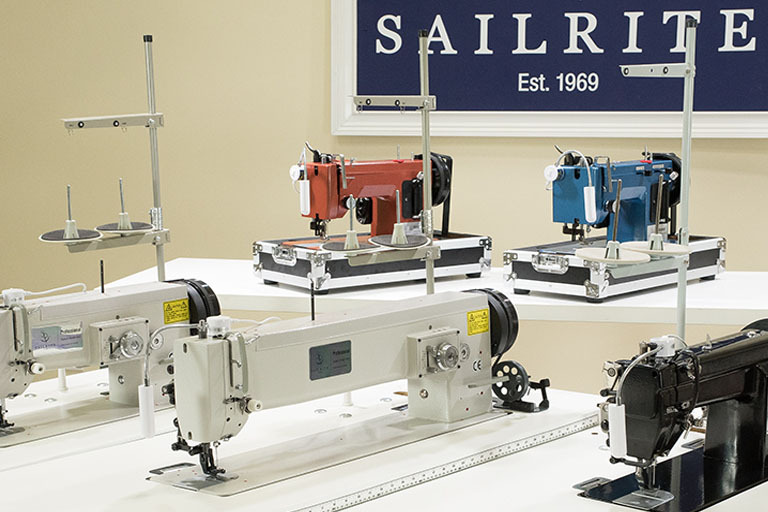 Sailrite may be the best sewing machine company you've never heard of. That's because they don't make do-it-all sewing machines for the home sewer. Sailrite is a manufacturer of industrial-quality sewing machines that eat heavy materials, including leather, for lunch and come back for seconds. When my friend and her husband decided to build a sailboat together, her job was making the sail. She found out very quickly that her Mom's hundred-dollar fabric store special wasn't going to cut it. Whether you're making sails, doing upholstery, or performing other heavy work, you need the right equipment. You won't find an encyclopedia of fancy stitches or programmable monogram fonts on a Sailrite. But if you're working in denim, leather, canvas, or other heavy-duty fabrics, a Sailrite will do your job with durability and precision. 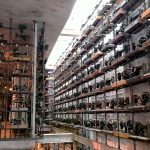 How Are Sailrite Sewing Machines Different? These are specialty sewing machines that do one job and do it well. 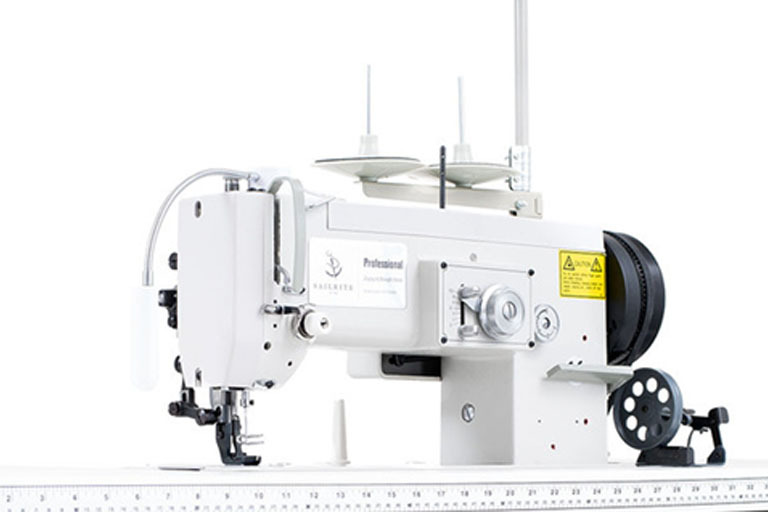 Like a straight-stitch quilting machine or a high-quality serger, sometimes you want a single machine that does a single job. Sailrite machines are made for working with canvas and other heavy fabrics. You won't find a buttonholer or embroidery stitches. There's no LCD screen or pattern editing, here. Another difference is construction. Sailrite sewing machines are classified as semi-industrial or industrial. Instead of decorative plastic exteriors, these machines feature solid steel construction. In fact, a reviewer from Quilter's Review looked for any plastic at all on the model they reviewed and found only a single knob. As a result, these machines are heavy -- Quilter's Review estimates around 35 pounds. On the other hand, they will take anything you throw at them, and if you drop it, your biggest worry will be damage to whatever it lands on. What Features Does A Sailrite Sewing Machine Have? Each Sailrite machine has a few special features that uniquely qualify it for heavy duty work. 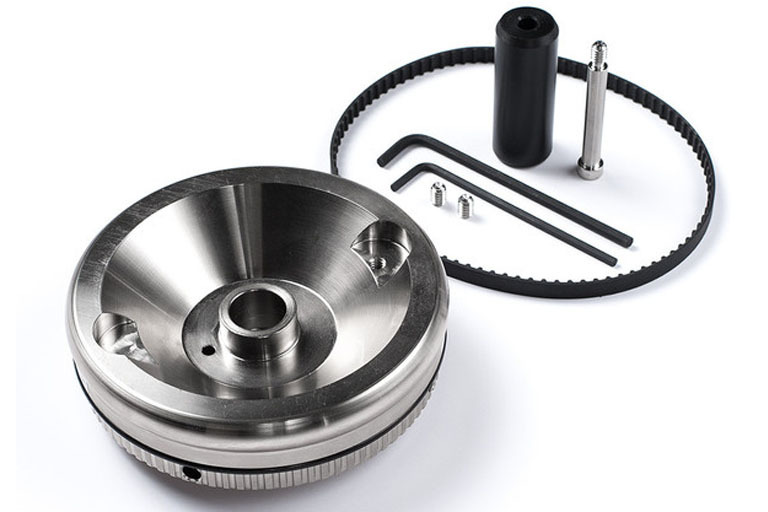 The Plus Balance Wheel offers twice the power and size of a traditional flywheel. As a result, you get power and control at a slower speed. And this is important. This is Sailrite's patented clutching system. It provides 100 percent power transfer from the balance wheel to the needle. And this allows the clutch to stay in place while you're sewing ultra-heavy fabrics. By ultra-heavy, we don't just mean a few layers of denim. The most basic, portable model, the LS-1, can sew through ten layers of heavy canvas with a smile. Surprisingly, these sturdy industrial and semi-industrial machines won't run you much more than a high quality dedicated quilting or embroidery machine. The industrial models are more expensive and are only available from Sailrite. You will, of course, have to buy the correct bobbins for your machine, but these aren't too expensive. Sailrite makes two semi-industrial models. By "semi-industrial," the company means for individual, personal use. This is one of the company's two portable walking foot machines. It's a straight stitch only machine, so if you're looking for one with a zig-zag stitch, this isn't it. They do make a machine with a zig-zag stitch, though, the LSZ-1, so don't despair. Reviewers are enthusiastic about this model, with the vast majority of customers who bought it from the company directly giving it five stars out of five. Customers and reviewers both loved its ease of setup and use, and agreed that it's a "workhorse." This is the premium semi-industrial model. It's still portable but comes with a zig-zag stitch. In addition, this model comes with a 19mm-wide zig-zag walking presser foot, which pulls thick fabrics through the feed dog with ease. 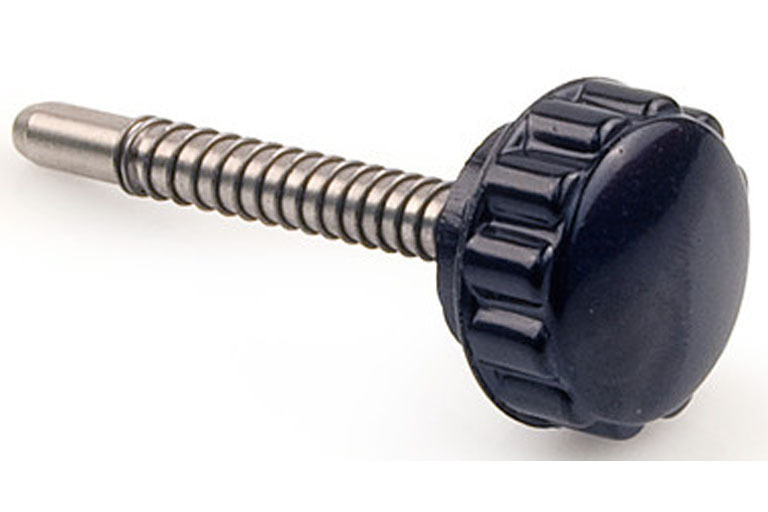 The presser foot can lift up a full 3/8", and, according to the company, this model can sew through any fabric or combination of fabrics that you can fit into that space. A whopping 88 percent of Amazon purchasers gave this machine four or five stars out of five. Professionals and consumers alike praised its durability and ease of use. Both reviewers and consumers remarked on this unit's weight, however, so if this is an issue for you, consider your purchase carefully. Sailrite makes several industrial quality sewing machines. By "industrial," the company means fit for a workshop or commercial operation. The Fabricator is Sailrite's entry-level industrial sewing machine. This straight-stitch sewing machine features Sailrite's special slow-speed control so that you can sew stitch by stitch with precision. The motor is a 550 watt, 3/4 motor. It has a generous presser foot lift, as well as a knee lift, which can be a godsend when you're working with multiple layers and large projects. The Fabricator also comes with an impressive accessories pack. Most reviewers who bought this product from Sailrite gave it five stars out of five. The others gave it four stars. It's worth noting that this model comes with not only a two-year limited warranty but also personalized user support from Sailrite. Like the Fabricator, this model also comes with a work table and the 550 watt, 3/4 horsepower servo motor. Unlike the Fabricator, however, this one was designed specifically with sailmaking in mind. To this end, its primary function is a four-point zig-zag stitch, which is standard in sailmaking. And if that's not enough, the accessories package is breathtakingly complete. There weren't a lot of either consumer reviews or professional reviews of this product. However, customers who purchased this from the Sailrite website were very pleased. This model is available from the company's website and costs $3,495. 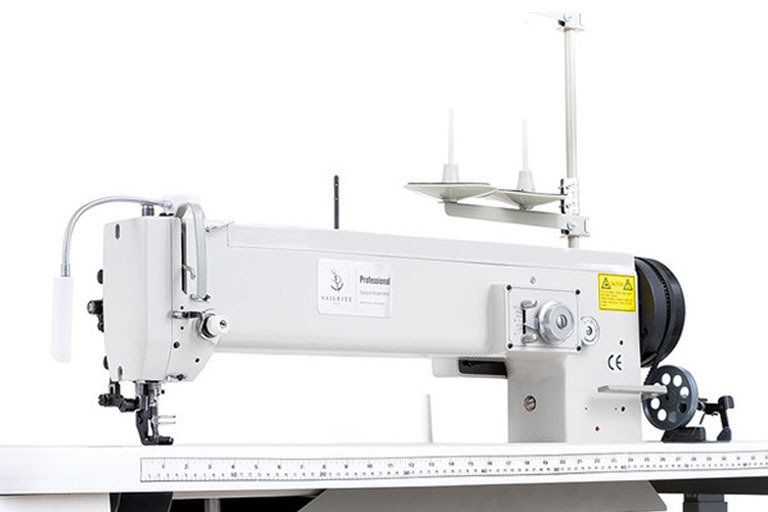 If you're doing a lot of large projects, a longarm machine could be a good choice. Like the other two industrial models, this one comes with a worktable and the 550v, 3/4 horsepower motor. This model also does the all-important four-point zig-zag stitch. If you're making sails for a boat larger than 50 feet, Sailrite reckons this is the model for you. The price of this model is $4,995, and you can get it from Sailrite themselves. Purchasers were pleased with this machine overall, citing its ease of use, stitch quality, and how quiet it is. For general heavy-duty use, we're going with the LSZ-1. We liked the fact that it has a zig-zag stitch in addition to a straight stitch function. And the added functionalities seemed well worth the modest increase in price. Also, there were considerably more consumer reviews for this model, which made us more confident in our judgment. As far as industrial machines go, that's a tough one. There's more information out there about the Fabricator. But it is a straight-stitch machine. If you're looking for an industrial machine that does a zig-zag, you have two to choose from -- the decision will come down to whether you want a longarm machine or not. 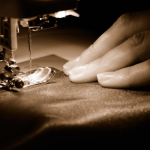 Is a Sailrite Sewing Machine Right for You? Do you make sails, work with upholstery, or do other projects that require you to work with heavy materials? If so, then a Sailrite machine could be a great investment. Durable, well-made, heavy-duty, and precise, these machines do one task, and they do it well. And if you're thinking about taking your heavy work into the marketplace, then a Sailrite industrial quality machine might just be the tool that makes the difference.